A simple, yet powerful note taking application. Is there a better alternative to Noted? Is Noted really the best app in Personal Info Managers category? Will Noted work good on macOS 10.13.4? iCloud sync: iCloud is built right into the Noted, it is automatically, without any effort from you, keeps your notes across all your Macs. Markdown: With Markdown, you can write beautiful notes all by using plain text to tag your formatting and preview markdown in-place. The iCloud sync. 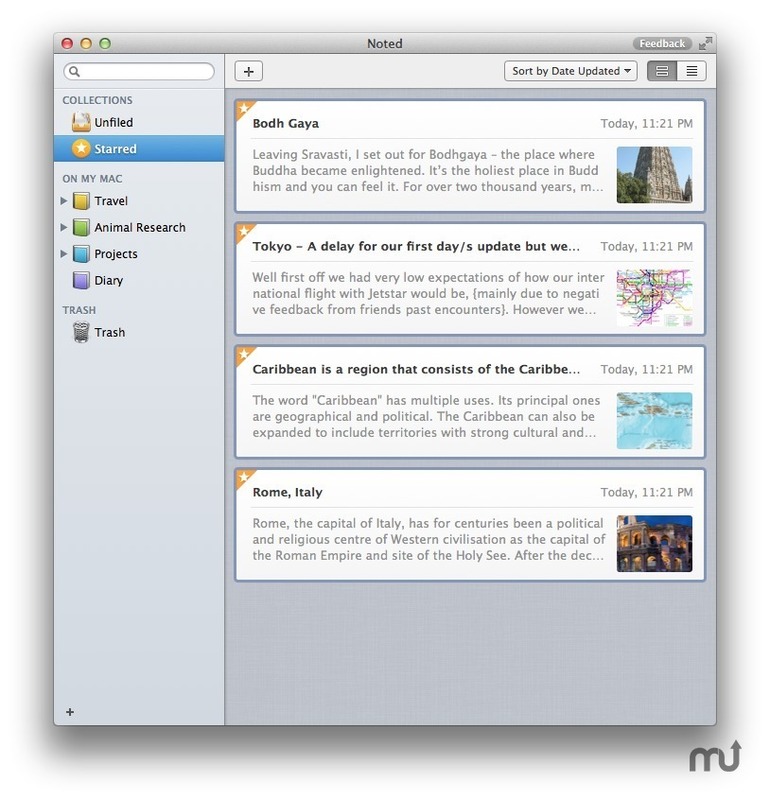 You can now keep your notes across all your Macs. iCloud sync only works in the full version, which you need to buy from Mac App Store. New shortcuts: Bold(Command+B) and Italic(Command+I) for editing text. Smartlists: An effective way to handle lists. Typing the first bullet character, then the Smart Lists "knows" how to add the rest of them. Attachments: Extending notes by attach files(Images, Videos, Documents, etc.) then Quick Look them in a convenient way. 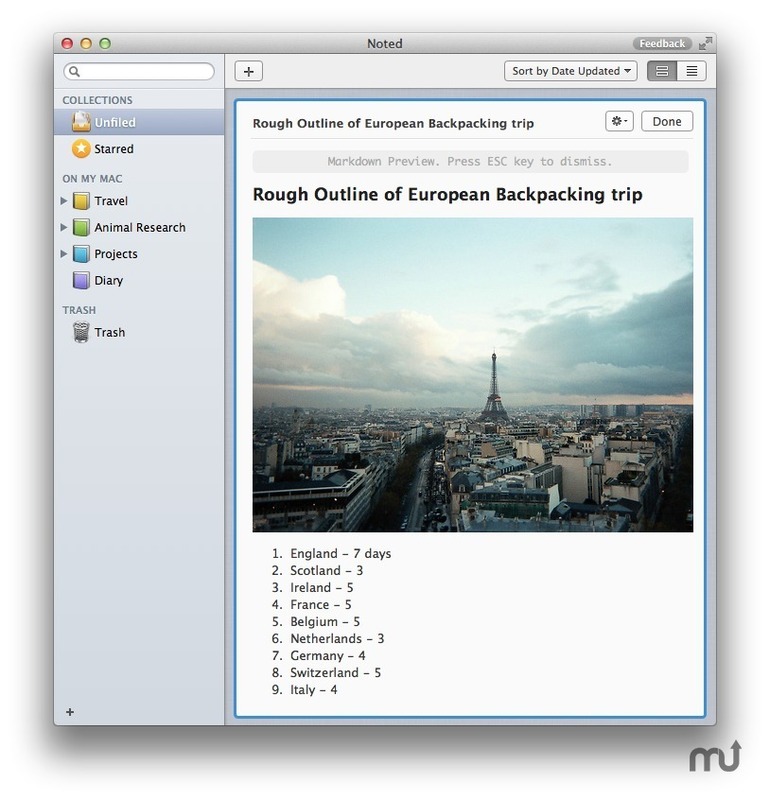 Instant Search: Noted instant shows search results in real-time as you type. It is the quickest way to find your notes. Unfiled: The Unfiled is the best place to jot down quick notes when you are not yet ready to decide where to put them. 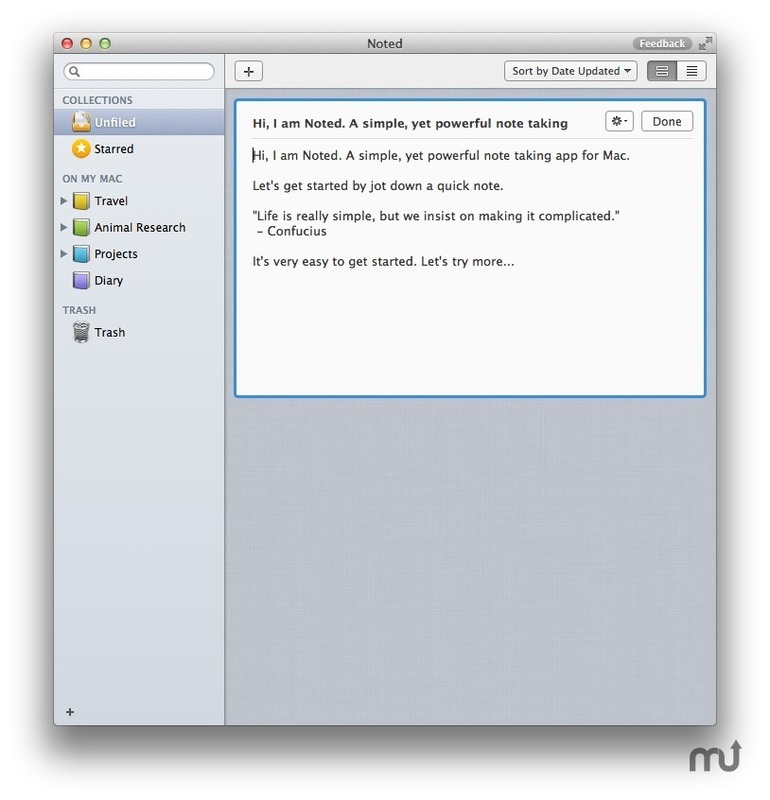 Starred: Mark notable notes as starred by menu action or drag to starred collection. An star symbol will make them easy to be find. Notebooks: Using Notebook to categorize your notes in different notebooks for different subjects or projects: work, home, travel, course, etc. Sections: If there are too many notes in one notebook, you can further categorize them into sections. Trash: You can recover deleted notes from trash unless you permanently delete them by empting trash. 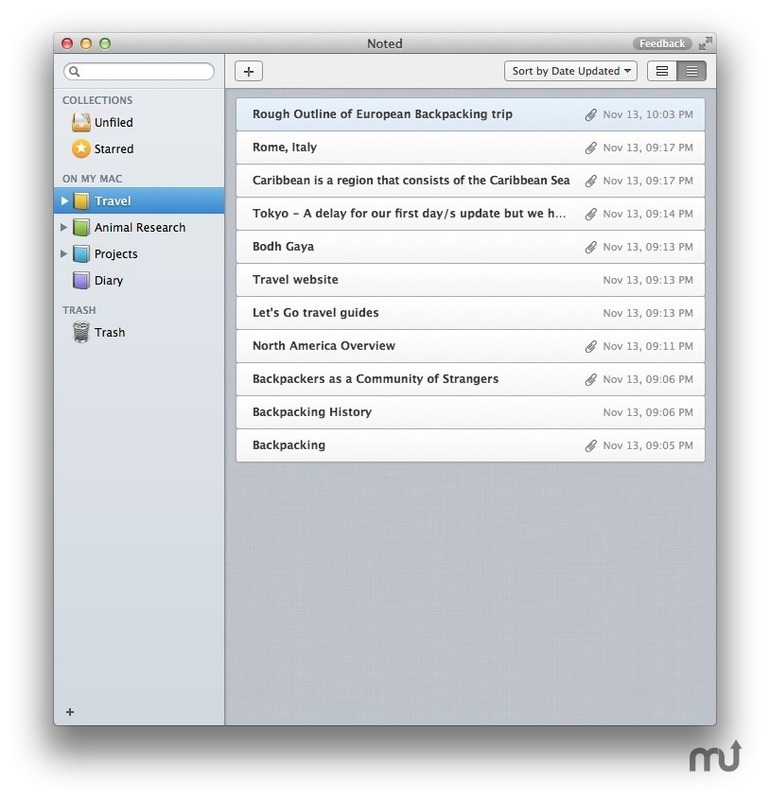 View Modes: Noted offers two view modes: Card and List. Card view mode will display more contents than list view mode. Full Screen: Use every inch of your Mac’s display by taking advantage of Noted’s built-in support for the systemwide OS X Full Screen feature. Keyboard Shortcuts: Almost all interactions are supported by keyboard shortcuts. You will never have to take your hands off the keyboard. 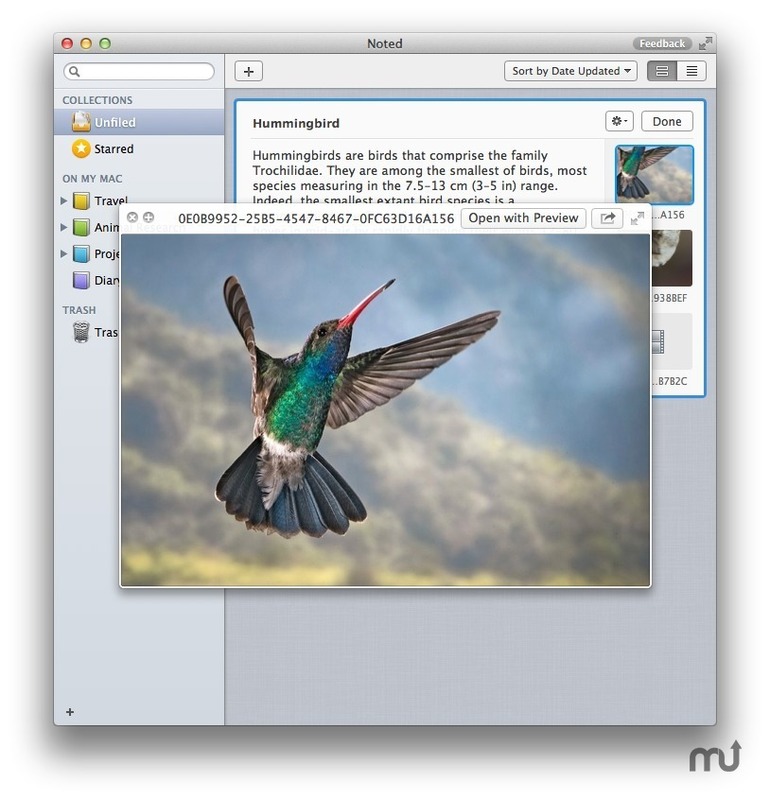 Sharing: Noted takes full advantage of the system’s built-sharing services. 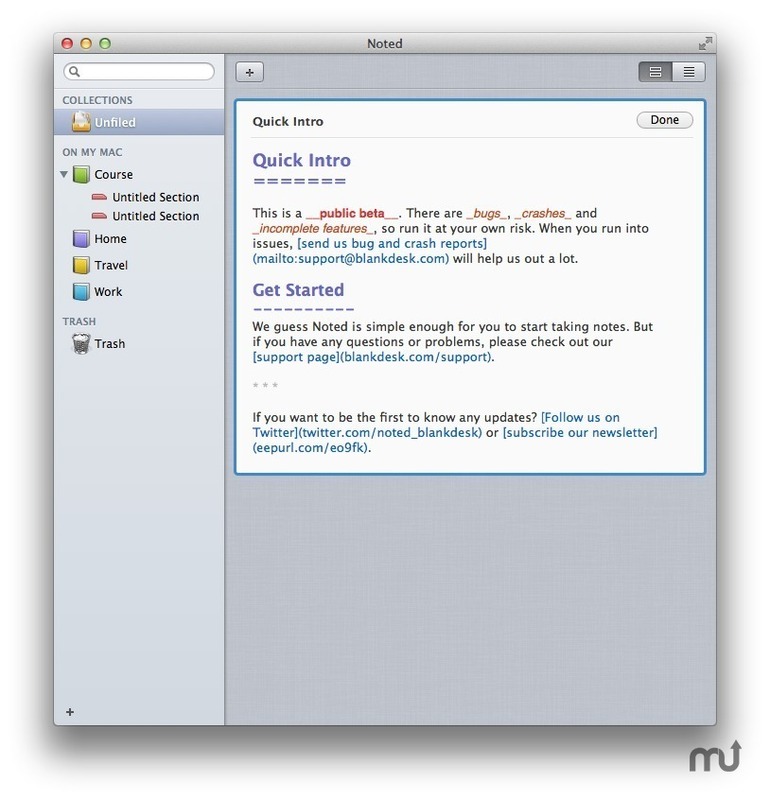 Share your notes via email, messages, etc. Export: Export notes into various formats (HTML, etc.) or copy HTML to Clipboard. More export formats are on the way. Colored: Not only multiple colors for notebook and section, but also 2 themes for whole interface.